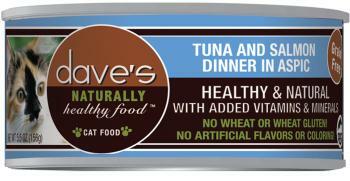 Dave's Naturally Healthy™ Adult Cat is designed to provide a healthy and balanced nutrition. It's made with real chicken, which means your cat will love it. Wholesome, fresh ingredients like cranberries and blueberries that may even help maintain urinary tract health. This food has no by-products, low magnesium, and has added vitamins and chelated minerals. This formula has no wheat, corn or soy. 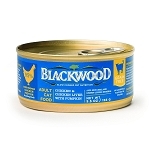 The Tuna & Salmon Dinner in Aspic canned cat food is the only can food my little girl will eat. I had tried just about every can food on the market she would not eat them. She would take one bite and spit it out. The Tuna & Aspic she goes to the fridge.and meows until I give her more. She eats a can a day or more now. I can not say enough good things about it and neither can my baby. THANK YOU. We've been trying various foods to solve our cats skin/fur problems. They are usually frustratingly picky, but they wolfed down both the canned & dried food as soon as I put it in their dish. They've been on this diet for just over a month with great results for skin and fur. They love the food; I love the results and the convenience of having it delivered. So glad our humane society had you on their website! Like the Dave's Chicken, this is a hit with my 5 old cats. Even our pickiest, Sam, licks the bowl clean!! Glad we can get this delivered instead of tracking it down. Cats love this stuff. *Are Pet Foods made in Thailand safe? 5.5 oz can - Feed one 5.5 oz container per 5 lbs of body weight per day. Feed a according to age, size and activity of your cat Feed at room temperature and refrigerate unused portion, your cat should have access to clean and fresh water.